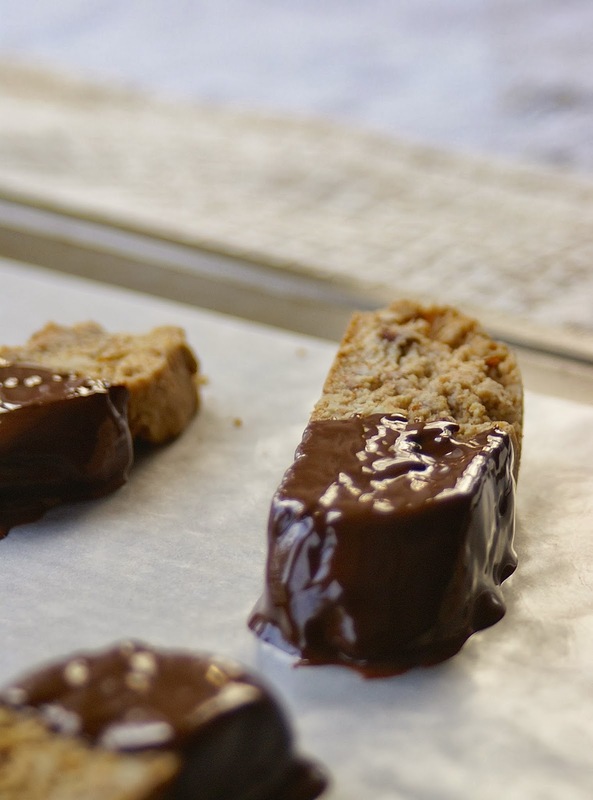 Biscotti are the perfect cookie. They are not too sweet, perfect for dunking, and basically can’t go stale! Somehow I usually forget about them until this time of year. I need to work on that because I really enjoy them! 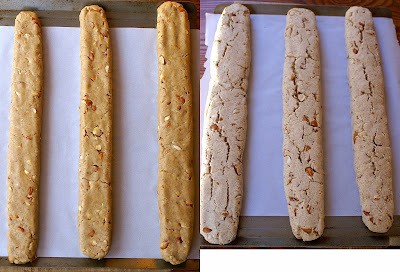 This recipe for almond citrus biscotti is a recipe that I have been making for the past few years. I love it so much I really haven’t tried many other flavors: the almond and orange combination is the so delicious and I have yet to meet someone who doesn’t absolutely love them. Cookies are one of my favorite gifts to give people. Not thrown-together cheesy tins of slice and bake cookies, but thoughtful and unusual cookies that are made with love and bound to impress. Biscotti are my go-to cookie. Not many people attempt to make them because they take a fair amount of time, but they yield a lot and it is time well spent. I refer to them as the “twice baked cookies” because you bake them, slice them, then bake them again. The best part of making biscotti, besides eating them, is the amazing anise smell that fills your house. It intensifies each time you bake them and sometimes I wish they were triple baked cookies, just for the smell! These biscotti are made with coconut oil instead of butter. You can use your favorite vegan butter (or regular), but I really love the the way these cookies come out using coconut oil. I’m just crazy for coconuts! In all seriousness coconut oil adds a slight sweetness and enhances the orange flavor. Butter, in my humble opinion, cannot compete. 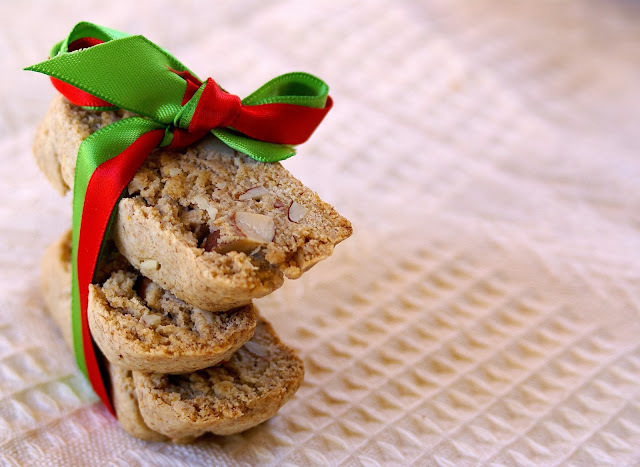 With whole wheat flour, chopped almonds, fresh orange zest, and anise extract there is nothing but amazing flavor with every bite. When making the dough, you can optionally use a liquid sweetener such as my favorite, maple syrup, in place of sugar. If you choose to use a liquid sweetener, you will not need to add almond milk. 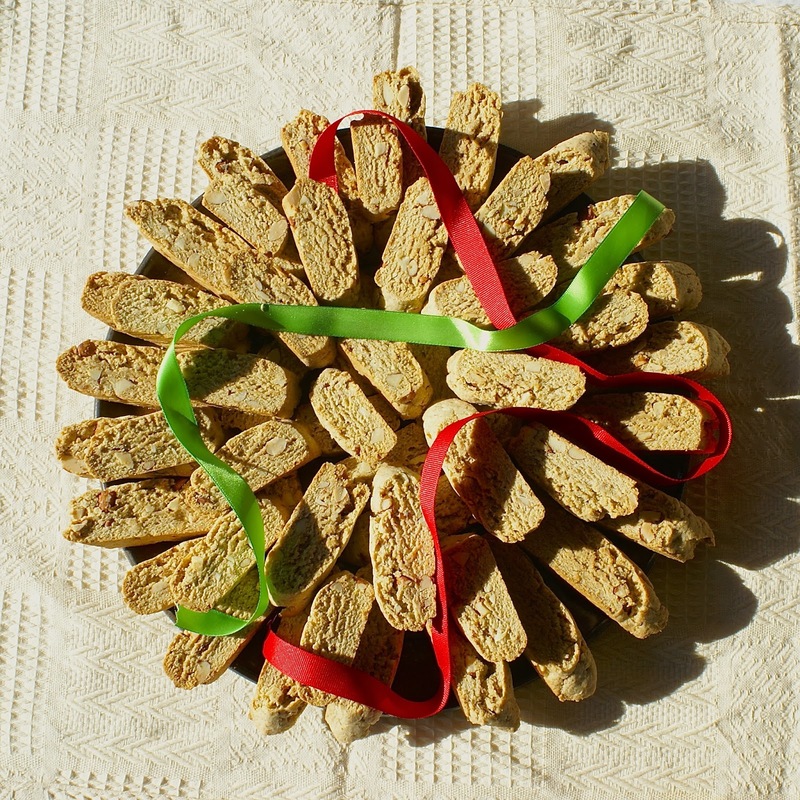 I usually make these biscotti with regular sugar when giving them away as gifts to make sure they are sweet enough for everyone receiving them, and reserve making them with maple syrup for myself. To make them extra fancy, I dip them in melted dark chocolate. Anything and chocolate is amazing, and this is no exception. They also look extra gourmet when dipped in chocolate! 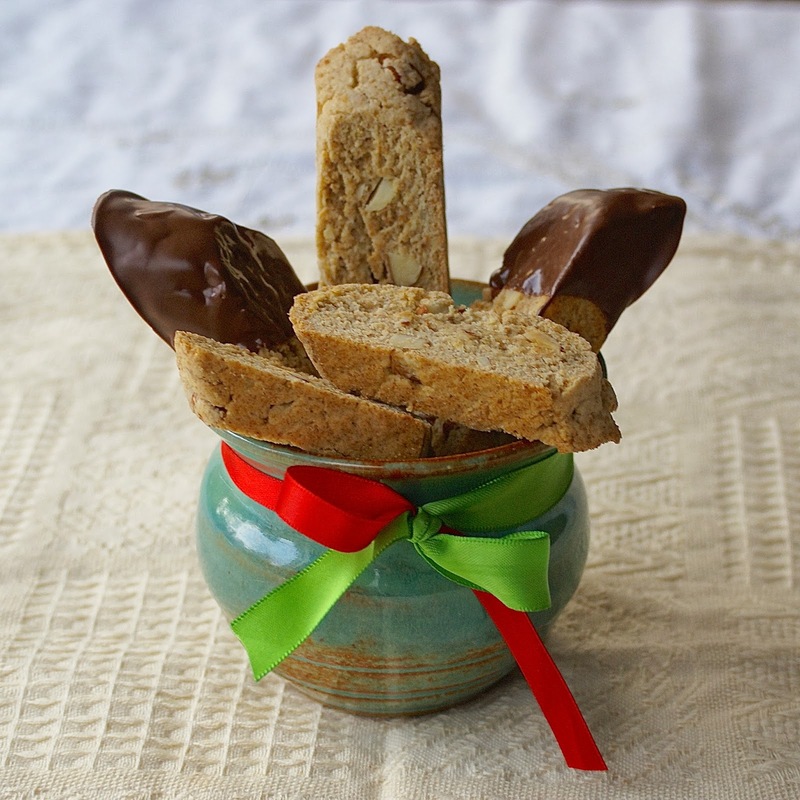 Spread the love this holiday season and add these biscotti to your holiday cookie menu. Or, make these any time of year and enjoy with a delicious cup of coffee. If you use a liquid sweetener, you will not have to add as much almond milk. You can use slivered almonds instead of chopped. In the pictures of making the biscotti, I was making a double batch. 1. Preheat oven to 325 F. Line a baking pan with parchment paper. Whisk together ground flaxseed and water and set aside. 2. Cream coconut oil for 3-5 minutes in a base of a kitchen aid, or with electric hand beaters. Add sugar, beat for another minute. Add flax-eggs, orange zest, and anise. Beat another minute. 3. In a separate bowl, whisk together flour, baking powder, and salt. Slowly add dry ingredients to wet. When almost combined, add chopped almonds and mix until just incorporated. 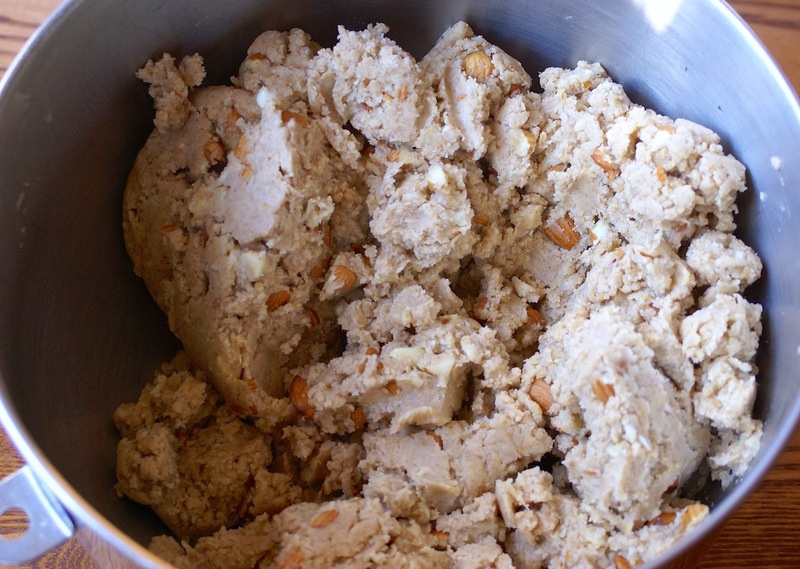 If dough is not sticking together, add almond milk one tablespoon at a time. Your dough should look like the picture below when done. 4. Mold dough into two logs, each about 2 inches wide and 1 inch thick. Bake in preheated oven for 30 minutes (don’t turn off the oven when you take the logs out!). Cool for 5-10 minutes. 5. Cut the end off each dough log, diagonally. Proceed to cut each log into 1/2 inch slices, following the first diagonal cut. Lay the biscotti on a the parchment lined sheet and bake at 325 for 10-15 minutes. Flip them over and bake another 10-25 minutes. Let cool completely on a wire rack. 6. If dipping biscotti in chocolate, melt chocolate and coconut oil together. 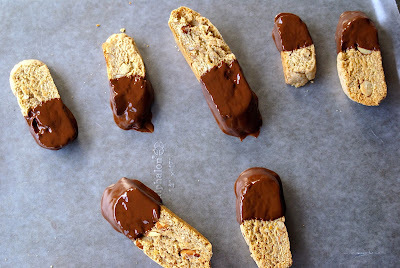 Dip up to 1/2 of each biscotti in melted chocolate and lay on wax paper. Allow to sit for up to an hour to harden, or put in the fridge to speed up the process. How is this GF with AP & Wheat Flour? Ahh it's not. Thank you for catching that! 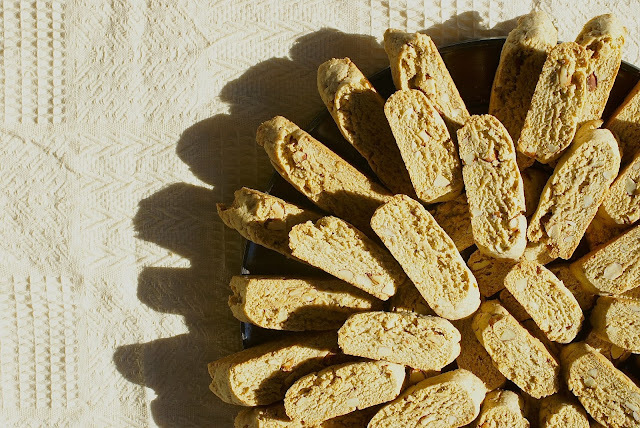 I was developing a recipe for these biscotti using almond flour to make them gluten free at the same time and I guess I was thinking about that recipe when posting this. This recipe is defiantly not gluten free! Hi Margaret, were you ever able to come up with the GF version? This recipe looks great! I've been looking for a good GF recipe using almond flour. Lemon zest should work fine, I would use slightly less because it is stronger than orange zest, try 1 Tbsp. The anise extract gives these a classic biscotti taste, however you can sub vanilla extract to have a more cookie flavor (think delicious lemon cookies!). Hope this helps!